Did you know that we have three book clubs at the library? Each of the book clubs has its own focus, and each one works just a little differently from the others. However, all adults are welcome at every book club. Here’s a little information about each book club, including when they meet. This was the first book club at the library, and started almost 17 years ago. 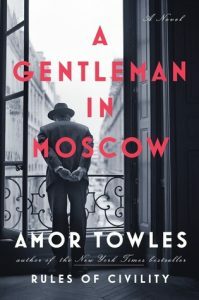 “A Gentleman in Moscow” by Amor Towles was a recent selection for Joyful Page Turners. It was originally planned to be a 4-month summer program, meeting in May, June, July and August of 2000. The members of the club enjoyed it so much that they decided to continue and are still meeting today. The club doesn’t limit itself to any specific genre of literature, having read non-fiction, children’s literature and more along with its more usual fare of general adult fiction. Linda Voth manages this book club. 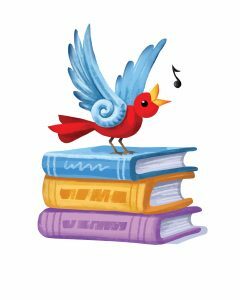 Joyful Page Turners meets at 6:45 p.m. on the fourth Thursday of the month, except in November, when it meets on the third Thursday. The club does take June, July and December off. The members of the book club take turns leading the discussions, and the member who is leading that month also chooses the book that will be read and discussed. They try to have the year’s titles chosen by February or March. 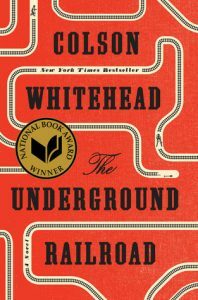 “The Underground Railroad” by Colson Whitehead was recently read by Bemused Bibliophiles. It has garnered a lot of recognition recently. Bemused Bibliophiles is the one book club that meets during the day at the library. Dawn Best, adult programming coordinator, leads this book group. Reading choices for this group tend to literary fiction, especially the hot and popular titles that generate a lot of buzz in the literary community. Bemused Bibliophiles meets at 1 p.m. on the first Wednesday of every month. Titles for this book club are chosen 4 months at a time, and discussions are lead by Dawn. Hauntingly Good Reads is for anyone who likes a touch of the paranormal, supernatural or just a little twist of the unusual in their reading. You may run across zombies, or witches, or vampires in the books for this book club, or there may just be hints that something is not quite what you might expect it to be. 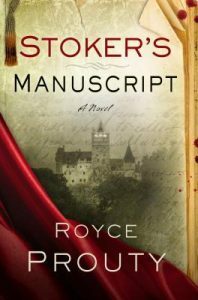 “Stoker’s Manuscript” by Royce Prouty was enjoyed by the members of Hauntingly Good Reads. Hauntingly Good Reads meets at 7 p.m. on the second Monday of each month. This book club is the most loosely structured of the book clubs with the selections coming from suggestions of the members of the club, and discussions are lively and organic. If you are interested in attending any of the book clubs at the library, you can learn what books they’re reading in several ways: check the online events calendar at our website, pick up the monthly brochure for adult programming, or follow our events on Facebook. You can also ask at the front desk. We hope to see you soon! Kristen Bradshaw wears a lot of superhero shirts. Though in the two years I’ve known her, I’ve seen her don the occasional skirt with leggings or laced blouse, Ms. Bradshaw’s uniform of choice is usually a Deadpool or Captain America shirt to pair with her streaks of electric blue hair. The attire is fitting for a superhero such as herself who wields a power so strong that it has built monuments and changed history. Kristen Bradshaw is a writer. Kristen has been writing consistently for four years, but was born a reader. The nineteen year old devours stories, soaking up their richness and seeking out new works to consume. Upon a suggestion from her older brother, Kristen tried telling a story of her own. It was a decision that led to a life-changing addiction. 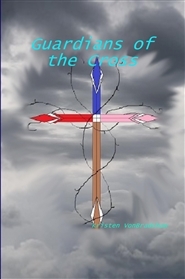 She now presents the self-publication of her first novel, The Guardians of the Cross, bound by The Book Patch. I took some time to talk with this young author about her writing process, the themes of the book, and her upcoming meet and greet at the library. Where did you get the idea for The Guardians of the Cross? My high school graduation was superhero themed, and I was interested in telling a story about a group of kids who discovered these special powers. I wanted to tell a story with a lot of characters and a lot of action. What was it like writing this novel? You are a self-taught writer, correct? Yeah, I’ve never had any training or anything. I just started. It was rocky at first, but after working at it for a while, it got a lot easier. It still took about two and half years to finish the book. What is your writing process like? Do you write every day or only when inspiration strikes? Do you have a certain ritual when writing? I try to write every day, usually in afternoon. I like to work on a computer and have music playing. It’s usually Disney songs or some other random music that I’m into at the time. My sister, Carolynn, sometimes hovers over my shoulder trying to read what I’m working on. Is that okay with you or do you prefer to keep your work private until it’s finished? It’s a bit of both. If I’m stuck on something, I’ll have her [sister, Carolynn] read it and help me out, but most of the time I like to get it all done first. I usually have my Dad read through it after I’m done to give me feedback, and my sisters have helped me with how the characters sound and talk. Were there any books or stories that inspired The Guardians of the Cross? I love the Percy Jackson series by Rick Riordan and borrowed a few names from his books. I love the action sequences and the relationships between the characters. One of my author role models is Christopher Paolini. He wrote the Inheritance Trilogy when he was young, and I relate a lot to his reasons for writing and his style. Which characters do you relate to the most? 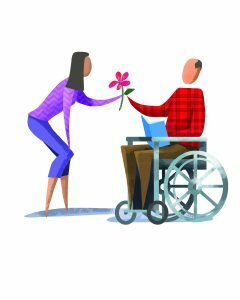 Are any of your characters inspired by people in your life? I relate a lot to Jinx because he’s so crazy and fun. I also relate to Brad and Phoebe. It was really fun to write Brad and Echo’s characters because they kind of took on a life of their own. They blossomed into the characters that they are and I was just kind of pulled along. Ella Grace is based off of my sister, Carolynn, and Jason is a bit of my brother, Jamey. The Guardians of the Cross tends to blend between the Young Adult, Christian Fiction, and Science Fiction genres. Was that intentional? I relate to young adult fiction since I’m still in that age group, and I love stories with a supernatural or magical twist. I want to write stories that show that being a Christian isn’t boring and reading the Bible isn’t boring. I wanted to write a story with Christian ideas that was interesting and exciting. I’m finishing up the sequel to The Guardians of the Cross. It will be a trilogy so I’ll start the third book next. I also have eight other ideas that I’ve been playing around with so who knows what I’ll write after that! Your meet and greet at the library is coming up. Is there anything you would like your readers to know? Thank you so much for reading my book, and I hope you like it! To find out more about The Guardians of the Cross, take a look at its Goodreads profile and add it to your to-read list! Community members can meet Kristen Bradshaw at her Author Meet-Up on Saturday, March 18 at 10AM in the library. Her novel, The Guardians of the Cross, is available for check out in our library collection.